Sometimes we are lucky enough to have an amazingly beautiful weekend to enjoy and actually be productive with it. After breakfast and about an hour at the dog park we headed to David’s Bridal to try on some bridesmaid dresses. I did the trying and Kevin helped snap me up, although it might have been more fun the other way around. 😉 After dresses we headed home to meet the auto glass guys who put in a new window in what must be some kind of record-10 minutes!? At about 3 we headed to the greenhouse for a rhodie, azalea and cool tree whose name I forget right now. But it has berries and is super gorgeous. We proceeded home to plant them in a strip of our front yard where we ripped up grass yesterday. Well, our friend ripped up the grass in about 1/4 of the time it would have taken us, but that’s another story. Anyway, in a strip about 3 feet wide and 15 feet long we now have beautiful shrubbery (slightly layered, etc. and we didn’t even have to say Ni! to get it!) with nice wood chunks covering bare ground. I’ll put some flowers in later. 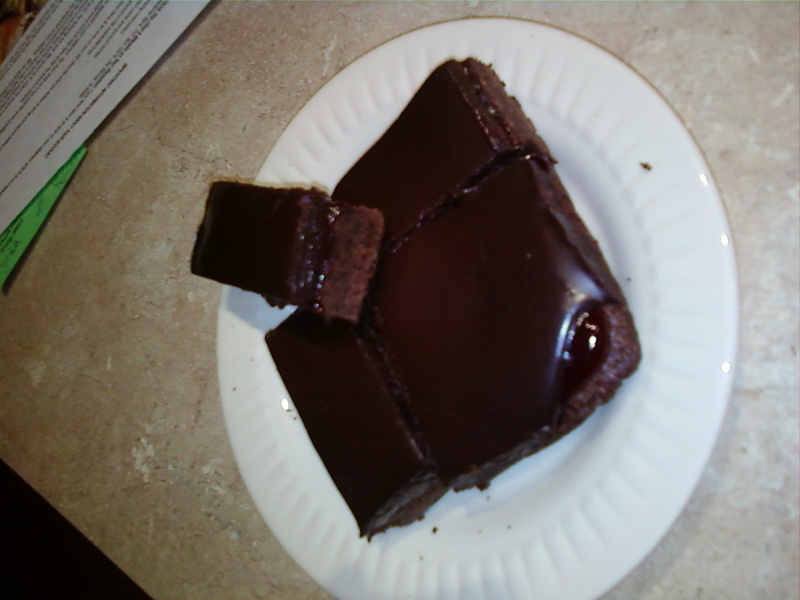 Basically it’s an excellent brownie recipe which you spread raspberry jam on followed by a kind of rich chocolate frosting (semi-sweet chocolate and heavy cream). What really makes ours special, in my opinion, is the jam which comes from a farm across the park. If you live in Vancouver or happen to be in the East Minnehaha area, stop by and say hello to the nice lady and dog at Kunze Farms. Their produce is to die for and at a great price. And the only raspberry jam I’ve ever tasted that was better than theirs is my great grandmas. Categories: Baking, Delectable Dabbling, Food, Sweets | Tags: chocolate, farms, Vancouver | Permalink. These brownies are not for the faint of heart. So rich. So chewy. So divine. I found the recipe here and decided, for once, to change nothing. Add a little powdered sugar to the top for decoration, but otherwise make these exactly how the recipe states. They are so perfect! 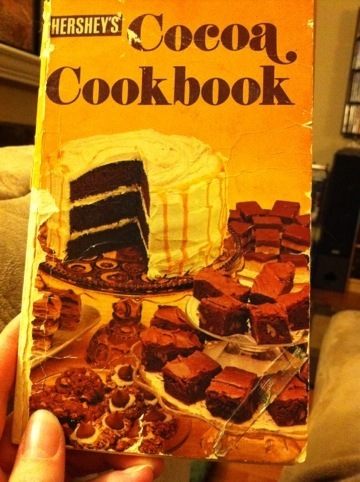 I’ve made brownies many times before, of course, but never this recipe so it is still new, right? 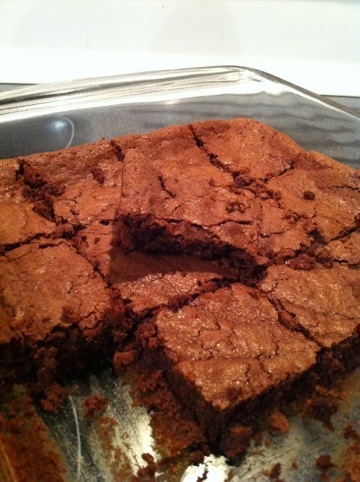 I was craving brownies so badly I just had to make some! Perhaps it is because of the proximity to Valentine’s Day, but all I can think of is chocolate, cherries, decadence, and love. Next weekend I plan to make chocolate covered cherries (they need to sit for about a week in a cool area to be perfect) to take on our romantic getaway to the beach. If you are also seeing red try one of these recipes: White Chocolate Raspberry Cheesecake, Raspberry Brownies. If there is one thing I have learned in my relationship with Kev it’s that good food is the best gift. If you aren’t feeling especially domestic you can always go for the tried and true chocolate covered strawberries. Who doesn’t love those?! Check back this weekend for chocolate covered cherries, as well as my grandma’s famous Valentine’s candy recipe (friends know it as the peppermint Christmas candy I failed to make in 2009). Super easy, but very special you will want to make this recipe part of your family tradition just as it has been a part of mine. Categories: Baking, Delectable Dabbling, Food, Sweets | Tags: chocolate, Valentine's Day | Permalink.